The chemical compound ammonia is a colorless gas that is highly toxic to the brain. When the amount of ammonia in the system surpasses the safe level, an ammonia overdose will occur and can cause harm to the individual [1, 2]. Ammonia is a gaseous chemical that has a distinct, pungent smell. If the gas is dissolved in water, it becomes a liquid-gas form. Ammonia is used in several industries including the production of a multitude of drugs. Ammonia can be found is household cleaners, liniments and fertilizers. Some examples of drugs made with ammonia are sulfa drugs, methamphetamine and crack. Aromatic ammonia spirit is also used to treat fainting by putting the chemical under the nose. Side effects that are associated with the use of ammonia include: headache, diarrhea and vomiting. The use of ammonia spirit may cause watery eyes and coughing [1, 2, 3, 4]. How much is Ammonia Toxicity? The normal amount of ammonia found in the blood is about 50µmol/L. If the level of ammonia reaches 100µmol/L, the patient may experience alterations in their level of consciousness. An ammonia level of 200µmol/L may lead to convulsions and coma. 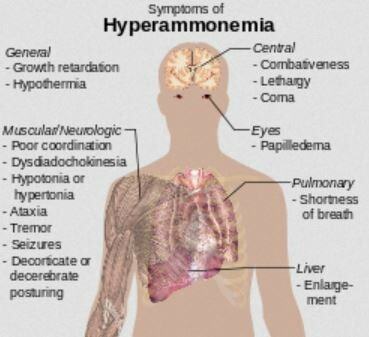 The symptoms cause by the different serum levels of ammonia are different for some individuals. There are others who are more sensitive to ammonia and may exhibit severe toxicity symptoms at relatively lower serum ammonia levels. Other factor that may affect the risk for ammonia toxicity is the presence of liver pathology. If the liver is unable to metabolize ammonia into urea, its level will accumulate quickly in the system and cause the toxicity [1, 2, 3, 4]. What are Ammonia Toxicity symptoms? Symptoms associated with ammonia toxicity are dependent on the age of the patient and some of them are reversible. Toxicity from aromatic ammonia spirit may cause tightness in the chest, a scratchy throat, dyspnea or difficulty of breathing and irritation of the eyes. If these are not managed it may lead to tachypnea or increased respiration, drooling, oxygen desaturation, wheezing and bluish discoloration of the lips and fingernails. Burns and ulcerations in the face and oral cavity may also occur. A massive inhalation exposure may cause the patient to lose consciousness. Burns to the patient’s skin has a distinct quality. They will appear soapy, yellow and has a soft texture. Severe skin burns will appear black and have a leathery texture [1, 2, 3, 4, 5]. Toxicity from ingested ammonia may cause abdominal, epigastric and retrosternal pain. A viscus perforation may even occur 48-72 hours after the ingestion. If pneumonitis or aspiration pneumonia occurs along with the ingestion, other respiratory symptoms may also be present. Symptoms of the toxicity may also manifest in the eyes of the patient. Some of these symptoms include inflammation of the iris, edema in the cornea and a semi-dilated fixation of the pupils [1, 2, 3, 4, 5]. What is Ammonia Toxicity management? Patients suffering from ammonia toxicity should be brought to the hospital immediately. The initial priority is to protect the patient’s airway, breathing and circulation. The changes in the level of consciousness of the patient may alter their ability to maintain respiration and an emergency intubation may be necessary. If intubation is to be performed, a large bore tube must be utilized to prevent plugging by the sloughed mucosa from the oral burns and ulcers. A blood test will be performed to get a baseline and identify the level of ammonia in the patient’s system. This test will be repeated throughout the therapy to identify the response of the patient to the treatment [1, 2, 4]. Eye injuries will be managed by irrigation with tepid water to change the pH of the conjunctiva. The goal is to bring the pH down to between 6.8-7.4. A referral to an ophthalmologist should be done to prevent more damage to the eye [1, 2, 4]. The ingestion will be managed initially by rinsing the mouth with water or milk. Induced vomiting should not be done in order to avoid the passing of the toxin to the mouth again and worsen the injury. A referral to a gastroenterologist for an endoscopic evaluation. This is to check the stomach and intestines for any injury [1, 2, 4]. Once the symptoms are managed, the patient who suffered from unintentional ammonia toxicity will be discharged. Those who are unstable may be transferred to the intensive care unit. Patients who have ingested ammonia may be discharged once endoscopy results show no further damage to the GI system. Patients who ingested a toxic amount of ammonia as a suicide attempt should be referred to a psychiatrist for an evaluation. The prognosis for this condition depend on the amount of ammonia that the patient was exposed to and how soon the management was delivered. The sooner the patient receives medical attention, the better their chances of improving are [1, 2, 4]. How to prevent Ammonia Toxicity? The best way to prevent an overdose in ammonia is to take medications according to the order of the physician. Any side effects experienced while taking the medication should be reported to the physician to prevent the development of complications. Medication and chemicals that are made with ammonia should be kept in a secured place in order to avoid accidental ingestion especially by children [1, 2, 3, 5]. The information above provides an overview of when an individual experiences an ammonia toxicity. If you know more about this, you can share it to others through the comment section below the page. Bachmann, C., Braissant, O., AM, V., Boulat, O., & Henry, H. (2004). Ammonia toxicity to the brain and creatine. Molecular genetics and metabolism, S52-S57.